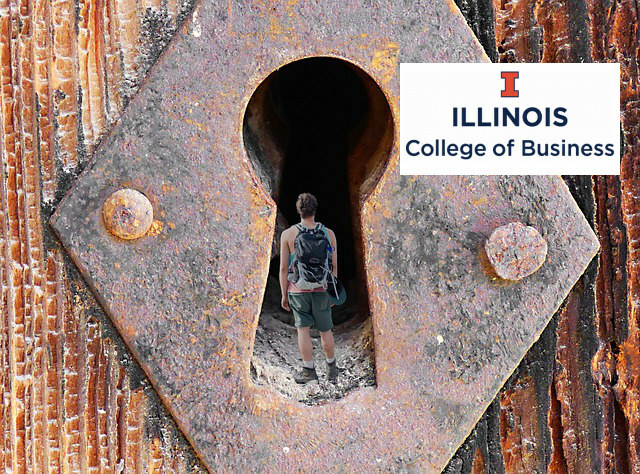 Just how hard is getting in to UIUC’s (Coursera) iMBA? Students have been able to earn an MBA online for more than two decades now. In the beginning most of the providers were for-profit and lesser known and lower tier universities. In the last decade more prominent universities such as the University of North Carolina have created online MBA programs. UNC Kenan-Flagler Business School played up their “eliteness” with the tag line “The Online MBA you probably can't get into”. The program costs about $124,000 so maybe it should be called the Online MBA you probably can’t afford. Recently big MOOC providers and their partner universities have moved into offering online undergraduate and graduate degrees. Edx offers a Micro Masters credential that one can turn in to a full by applying to the University of Maryland online MBA. Edx will have a full MBA on it’s platform next year. Coursera is the first to offer a full MBA via University of Illinois-Urbana-Champaign. Students take 18 courses along with 4 projects. The estimated time to earn it is 2-3 years though one can take longer. The cost is about $22,000. The on campus program is ranked 48th in the US by US News & World Reports and 83rd by Financial Times in their world rankings. Not elite but at a solid school that isn’t going to be a negative on your resume. Both US&WR and FT rank online MBA programs but University of Illinois-Urbana-Champaign didn’t partake in the rankings for its Coursera based online MBA. The degree will not have “online” on it so employers won’t automatically know a student earned it online. So just how hard is it to get into this MBA program? Maybe a little harder than one might think. For the 2016-2017 year there were 1,035 applicants out of which 498 were admitted. This means just under half of all applicants were admitted. Or if you look at the world in a “glass half empty kinda way” just over half of all applicants were rejected. How does this compare with the on campus program? Well it had 275 applicants and only 86 were admitted, or about 31%. The on campus is more selective but there were fewer applicants for even fewer spots. 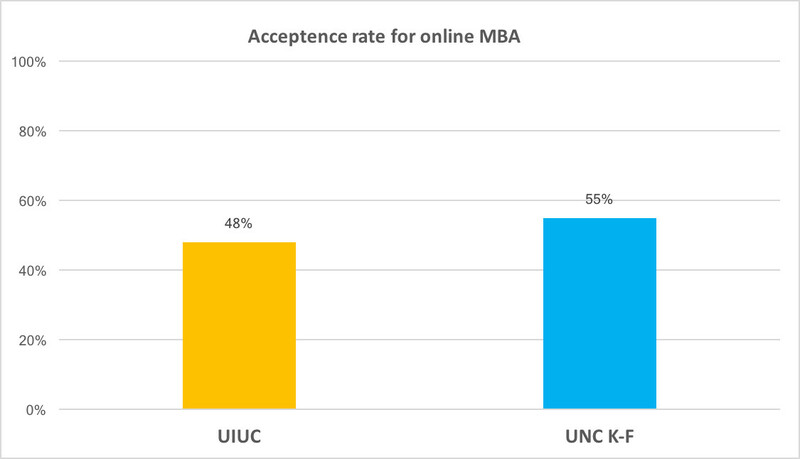 How selective is the pricey UNC Kenan-Flagler online MBA? They had 1,186 people apply and accepted 649, an acceptance rate of 55%. Slightly higher than UIUC. Unsurprisingly UNC Kenan-Flagler no longer advertises itself as “the Online MBA you probably can't get into”. Looking at the yield of at both programs we see of the 498 who applied to UIUC, 452 enrolled which is a yield of 91%. Out of the 649 admitted to UNC Kenan-Flagler 497 enrolled which is a yield of 77%. Over all UIUC is slightly more selective and has a higher yield than UNC Kenan-Flagler. Does that mean UIUC is better? Not necessarily. 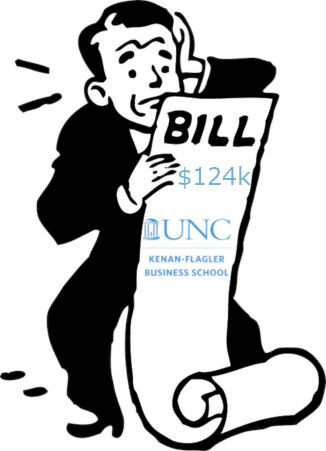 UNC Kenan-Flagler higher sticker price of about $124k most likely has more resources for students and small class room sizes. Some students in the relativity inexpensive UIUC online MBA have complained about very large class sizes. If money was of no concern one would probably pick UNC Kenan-Flagler. For most money is a concern. Is UNC Kenan-Flagler $82k better than UIUC? That would take a more in-depth examination. What can be said is, it appears UIUC online MBA is at least as selective than many mid tier MBA programs and is among the least costly.